BB Becker's romantic necklace bears a wave of sterling sentiment. 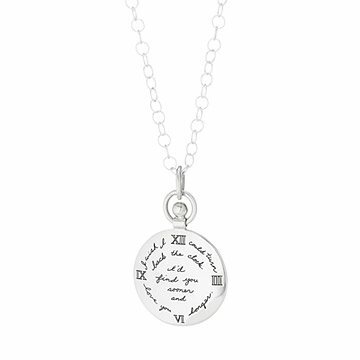 With one of the most romantic quotes of all time encircling their neck, the lucky wearer of BB Becker's silver necklace will know they are deeply loved. "I wish I could turn back the clock. I'd find you sooner and love you longer" is engraved in the handwriting of the artist's wife Josephine, adding a personal and intimate touch. The shiny, curling wave is simultaneously clever clasp and design highlight, embodying the sea's unfailing surf and love's perennial renewal. Use of some dipping solutions, abrasive cleansers, or anything other than a soft, clean cloth may damage the finish. Silver is a soft, precious metal and can be scratched or dented by careless handling. Would love to purchase this again if better quality chain was used. The perfect gift to give to someone you love more than life. Can easily dress it up or down. A truly beautiful piece of jewelry!! I bought this as a Valentine's Day gift for my wife. As a couple in our early 50's the sentiment seemed perfect. It's also a beautiful, elegant piece that she can wear with anything.